5 Ft. Rectangular Concrete Picnic Table with Bolted Frame, 1385 Lbs. 7 Ft. ADA Concrete Rectangular Picnic Table with Detached Benches, 2620 Lbs. 66" Round Concrete Picnic Table with Steel Frame, 800 Lbs. 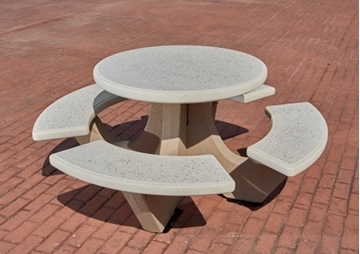 38" ADA Concrete Round Picnic Table with Bolted Bench Frame, 860 Lbs. 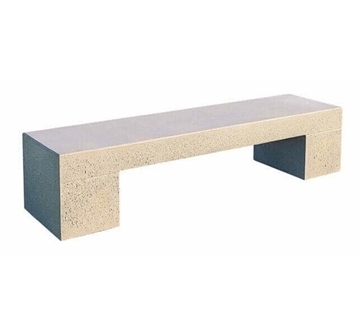 Concrete Outdoor Furniture includes concrete outdoor picnic tables, concrete outdoor trash cans, and Concrete outdoor benches that are all outdoor commercial grade furniture made from commercial cement. 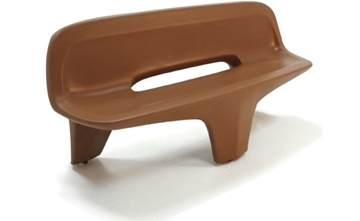 Furniture made from concrete is heavy, durable, and is the best furniture selection when public exposure is constant. Highly vandal resistant, Portland cement is used meeting A S T M C150 specifications. All aggregates meet ASTM C33 specifications, to be cleaned of foreign matter and properly graded to size. Colors used are inorganic, resistant to alkalinity. Recycled steel is used for reinforcement. The best news is our factory uses special trucks to deliver professionally with surprisingly low shipping rates. Many models are in stock for east coast and west coast distribution. Our prices are tailored to make the most of your budget.